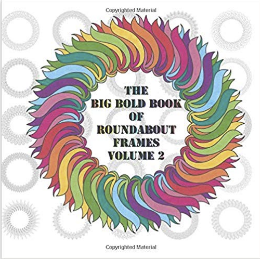 Big Bold Book of Roudanbout Frames,101 single page drawings, gives you a lot more than just coloring, also very good for scrapbooking, you can use your colored art to make photo frames, garlands, memo boards, mobiles, dreamcatchers, children's ring game, whatever comes up in your mind, you can make with it. You an find a lot of examples on our booklaunch pages, to help you out. Show us your ideas on our FB group GDG to inspire others too!